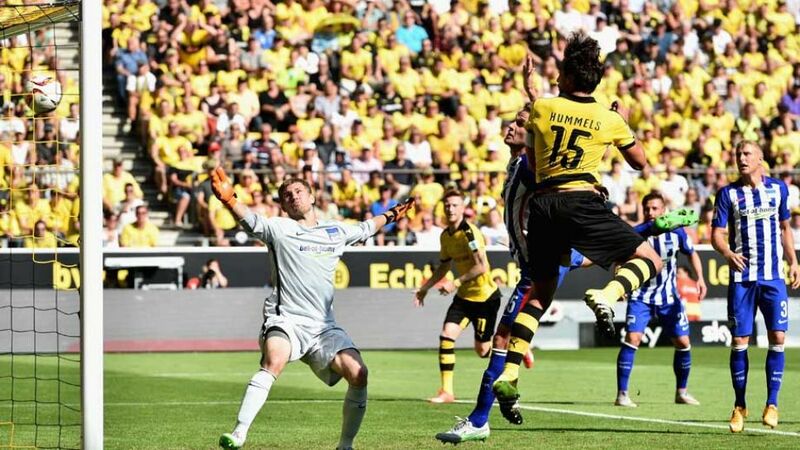 Dortmund – Borussia Dortmund’s sensational start to the 2015/16 campaign continued on Matchday 3 as they clinched a third straight win, their eighth out of eight in all competitions, by beating Hertha Berlin 3-1 at the Signal Iduna Park. Dortmund were initially frustrated by the deep-lying visitors, who went closest to scoring inside 20 minutes with Roman Bürki beating away Vladimir Darida’s drive. However, the tides turned when Mats Hummels headed home Shinji Kagawa’s cross in the 27th minute, allowing BVB to retain possession and intelligently defend their lead, which was almost doubled when Henrikh Mkhitaryan stung the palms of Thomas Kraft before the break. The hosts began brightly after the restart and doubled their lead when a delightful team move ended with Matthias Ginter picking out Pierre-Emerick Aubameyang for a tap in. Kagawa and Marco Reus both squandered clear-cut chances to add a third, which threatened to prove costly when Salomon Kalou reduced the arrears. However, there was a late sting in the tale for Hertha when substitute Adrian Ramos put the game to bed by scoring against his former side. Borussia Dortmund may have conceded for the first time in the 53rd Bundesliga campaign, but that takes nothing away from Mats Hummels’ imperious performance, which was epitomised by his last-ditch challenge on Genki Haraguchi when it was still 0-0. Opening the scoring was a bonus for the BVB captain, but winning 75% of his challenges and completing 84% of his passes, it was his marshaling of the hosts’ backline that kept Hertha at arm's length but for one moment in the second half. There is just no stopping Borussia Dortmund at the moment. Thomas Tuchel has breathed new life into a dynamic squad, shoring up a backline which proved prone to individual errors in the previous season, whilst inspiring a free-scoring frontline. BVB’s performances are a flashback to Jürgen Klopp’s early years and, with the quartet of Reus, Kagawa, Mkhitaryan and Aubameyang all tapping into their full potential, the five-time champions could prove to be FC Bayern München's sternest title challengers. Mats Hummels has scored 11 of his 18 Bundesliga goals with his head.Seven different players have already scored for Borussia Dortmund in the current Bundesliga campaign – a league-leading statistic.Julian Weigl had 109 touches of the ball - the first time he's broken the 100 touches mark in his Bundesliga career.